While looking on a cruisers forum I came across this unbelievably easy mast raising system. Google mast raising tool . I can raise the mast on my 26 pretty easily using the " Chrysler method" but it takes about 20 min to get all the rigging in place then another ten min to roll up and put away the straps and then putting the boom on and installing the main. This system is all set up in the companionway and should take about 5 min . No going to the bow until you attach the fore stay. In the comments a 60 yr old widow claims she can set up her mast safely by herself. The boat the guy is demonstrating on looks like a 22 ft er . Check it out . I think it will work on a 26. I plan on trying it as soon as I have time. Let's hear what you think. There are a lot of mast raising ideas here on this forum also! Poke around and various ideas from members here! I made a gin pole for the C22's and found it very useful and easy to use. Dedicated lines made stepping and unstepping my masts pretty quick and easy. Others here have even better ways! The Catalina 22 video I found I assume is what you are referring to. His method of "no Gin Pole" I could not see any support to keep the mast from swinging port or starboard. I'm chicken and the masts on the Chryslers are pretty dang heavy. I did not watch the other vid. 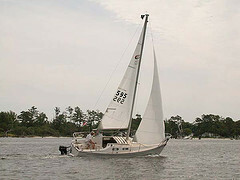 I did help a friend drop a mast on a San Juan 24 in the water once! Took 5 guys and we just muscled it down! LOL! Thanks for the reply! I agree the Chrysler method works well but the system I was looking at looked faster and easier. The system I saw used 2 poles mounted from the companionway ñthat kept the mast centered , it may not work on a heavy mast like the Chryslers have but I'll try it with a safety at home first. Once I get around to it I'll post a report on how it went. I had a better system using a 12x6, a winch, some ratchet straps, and a block. I'll have to diagram it sometime. I'm planning in setting up the same system to raise and lower the Compac 23 mast.